On Feb. 19, 2018, demonstrators protest pension reform proposed by then-President Michel Temer's government in Sao Paulo, Brazil. Brazil's government is sticking to its goal of having its pension reform bill, with promised public savings of more than 1 trillion reais ($262.5 billion) over the next decade, ready for a vote in the lower house of Congress by the end of May. In an interview with Reuters in Brasilia on Tuesday, Rogerio Marinho, secretary of social security and labor at the Economy Ministry, pushed back against market concerns that the timeline and savings target are too optimistic. Investors say tackling Brazil's crippling social security deficit is critical to putting the country on a firmer economic and financial footing. The Economy Ministry has warned that failure to pass any reform will plunge the economy into recession as early as next year. "The proposal we are putting forward to Congress is one that we think is adequate for the country," Marinho said when asked if savings of 1 trillion reais was an achievable target. Asked if anything less was therefore "inadequate," Marinho said the Brazilian parliament would discuss the bill and "make modifications, even improvements." The government's reform package aims to raise the minimum retirement age for men and women, increase the length of time workers must pay into the system, and reduce benefits for rural workers and military personnel. The bill projects total savings over the next decade of just under 1.2 trillion reais ($315 billion). Brazil's Economy Minister Paulo Guedes speaks during a ceremony at Planalto presidential palace in Brasilia, Brazil, Jan. 7, 2019. 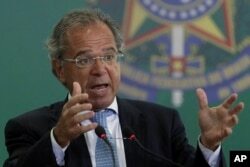 Economy Minister Paulo Guedes said last weekend that 1 trillion reais was an "important line" in the sand. But recent surveys from Morgan Stanley and Brazilian brokerage XP Investimentos show investors expect that will be watered down to around 700 billion reais. Marinho recognized that the complexity of the proposals and challenges in overhauling a decades-old system. The draft bill was only presented on Feb. 20, but he is confident it will be ready for a vote by the full lower house in May. "In terms of timing, we are able to meet our deadlines. Everything will depend on the dynamics of the debating process in parliament," he said. "We know pension reform is not an easy process. But we're very happy to have that debate." Once passed by the lower house, the bill will go to the Senate for final approval. While Marinho and other officials say support for pension reform among lawmakers has never been higher, a lack of political cohesion in Congress could delay approval. Some analysts say it could drag out until the final months of 2019. 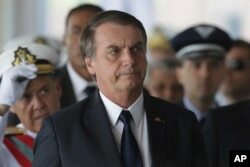 In that regard, Marinho applauded President Jair Bolsonaro's recent tweets, statements and video selling pension reform to the public, following criticism from some allies that he had been too silent on the issue. Asked if pension reform depended on Bolsonaro's support, Marinho said: "I think so, but it also depends on a narrative based on facts." "He has credibility. Without doubt he is the leader of this process, and anything he does will be beneficial, including galvanizing and mobilizing people to get onside with this change that's so necessary for the country," he said. Analysts at BNP Paribas on Monday noted that of Bolsonaro's more than 500 tweets since becoming president, only five were about pension reform. That is fewer than the eight jokes he has tweeted out to his 3.68 million followers.